I've been trying to grow some chiltepin plants (a tiny pepper) from seeds taken from a plant that has been growing at my parent's home in Texas for more than 20 years. 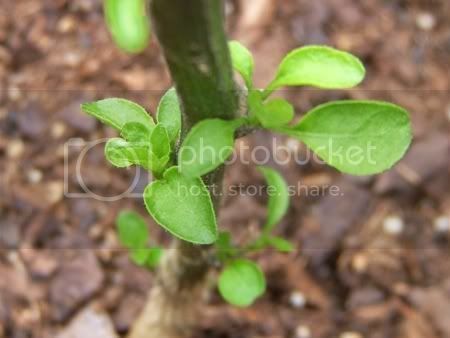 Unlike most pepper plants, their chiltepin stays alive during the winter so they don't have to re-plant it every year. 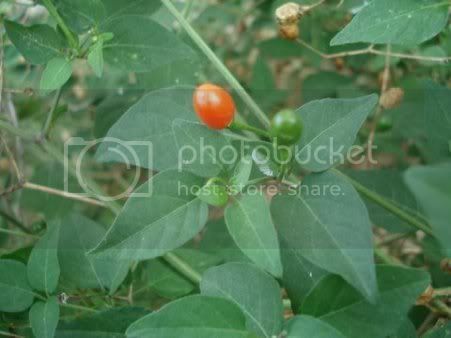 My goal is to also get a chiltepin to survive year round here at my home in Arizona. I started growing my plants indoors last May and ended up with 31 seedlings (all the seeds were from one tiny pepper, I might add!). Eventually they started to attract pests so in early fall I moved them outdoors. They grew much faster outside and were just beginning to develop peppers when it started to freeze. I worked hard to cover them up when it got too cold, but I had to leave for two weeks over Christmas and, well, they didn't make it. Since I had been working on them for 8 months I was pretty upset (I have to admit I cried a little). I couldn't bring myself to pull them up and throw them out so they've been sitting in my backyard for two months. I was making plans to have my mom send me some more seeds when I happened to look at the plants and I was surprised to find that there were tiny green leaves shooting from the bases of many of my "dead" chiltepin plants! I guess they were just hibernating! The chiltepin seeds can take a month or more to germinate so I was very happy that I didn't have to mess with trying to get them to sprout again. Since I had let them grow too tall while they were inside (they had to be held up by stakes) I decided now would be the best time to prune them a little. Even though they looked pretty dead it was still hard for me to cut them back. I left them all at about 6 inches. There are still about 1/3 of the chiltepin plants that don't have any new leaves, but the stems of all the plants were green on the inside when I trimmed them so I'm hoping that those will come back too. And as soon as the plants have recovered enough, I'm going to put them in the ground - no more messing around with plastic buckets! Hopefully they'll have enough time this year to make some peppers so I can try cooking with them. I'm glad to see your plants are not giving up. I totally understand that disappointment and sadness. I had something sort of similar happen this week. Last year, I started to buy plants for my yard - potted and planted the ground - everything looked so pretty and lush. Then the winter came! And the hungry deer began to eat things they normally wouldn't. So lots of my plants looked miserable or worse. But just yesterday I noticed a plant pot laying on its side (discarded there till spring and I figure out what to do with it) and some leaves reaching around the side. When I set it up right I found the plant was growing again - awkwardly to the side - but already it is righting it self in the pot. I was soooo happy! Not to mention I felt a little bad I had given up on it so quickly. Patience really is the key with mother nature. One thing I am not the best with. P.S. Sorry for the long comment. I know, I'm so glad I didn't throw out all my chilies when they "died"! I was going to but I was lazy - one of those times when being lazy pays off, I guess! I have to say, I love the variety of your blog. Sewing, gardening, paper crafts...it has it all! I love it! Thanks! I don't have a great track record with plants, but I've had a few things manage to survive over the years. I have a pretty good story about a cactus, I think I have a photo of it somewhere so maybe I can do a post about it soon. Great Job on keeping the plants going. 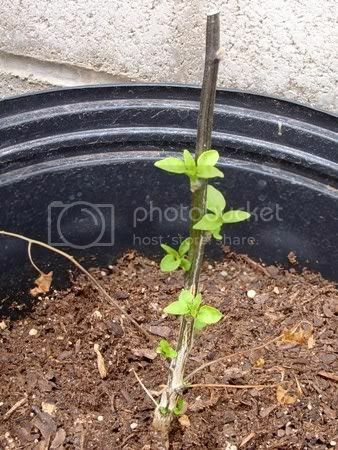 True Chile Tepin are Perrenial which means they come back every year and in the winter they die back but do not mess with them and new sprouts will appear around the base in the spring. I had a huge bush on some land and I was picking Jalapenos form my garden and then I went down and picked some Tepins. I had Jalapeno pollen on my hands and the next year there were a bunch of small sprouts around the base of the old Tepin bush, well I dug them up and put them in pots like you thinking they were Tepin babies, but the peppers were like mini Jalapenos, perrenial, and hot as heck. I guess I accidentally crossed a new species...I love them and I hatched about 50 this year in pots. Nice work. 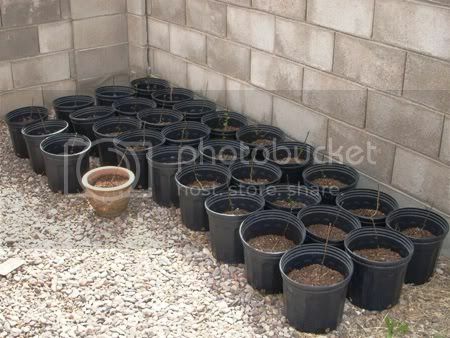 I just started about 11 little 4 inch starter pots that are beggining to show. The plants are just surfacing with two leaves one on each side. Anyone know at what point to replant these in a bigger pot? They seemed to shoot up pretty rapidly, but now have just stopped right above surface. Im wondering if the pots are too small and not allowing them to grow any further? Chiltepins are very slow growers so I bet that is why they don't seem to be getting big. I had my plants in 2 inch pots for a very long time and they got pretty large in them - it just took months and months! I appreciate the feedback. Let's see what happens. Good luck with you Chiltepin's! Just seeing the first sprouts of my first chiltepín ever. It's a reward to my hope. Your re-born chiltepin is a reward to your tears. Actually, they resemble green teardrops. Will there be another nativity pattern soon? I've found Mary with Jesus and an angel. Lisa, there is also a sheep pattern: http://www.craftycattery.com/2013/01/amigurumi-nativity-crocheted-sheep.html There will not be a new pattern this year as I ran out of time.